Hatton National Bank is a premier private sector commercial bank operating in Sri Lanka with 251 branches spread across the island. The bank has been internationally recognized by the Asian Banker Magazine as the “Best Retail Bank in Sri Lanka” on ten occasions from 2007 to 2017. The Banker Magazine of the UK named HNB as the Bank of the Year in 2012, 2013 and 2017. HNB is also placed among The Banker’s Top 1000 banks in the world. 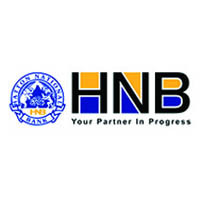 HNB is actively involved in retail banking, corporate banking, international banking, treasury and project ¬financing. In 2012 HNB became the 1st Sri Lankan bank to obtain an international credit rating and was assigned a foreign currency issuer rating of B1 on par with the sovereign rating by Moody’s Investors Service. The bank’s national long term rating by Fitch Ratings (Lanka) Ltd is AA-(lka).